Make these sweet potato bars with maple frosting and everyone will ask for the recipe! 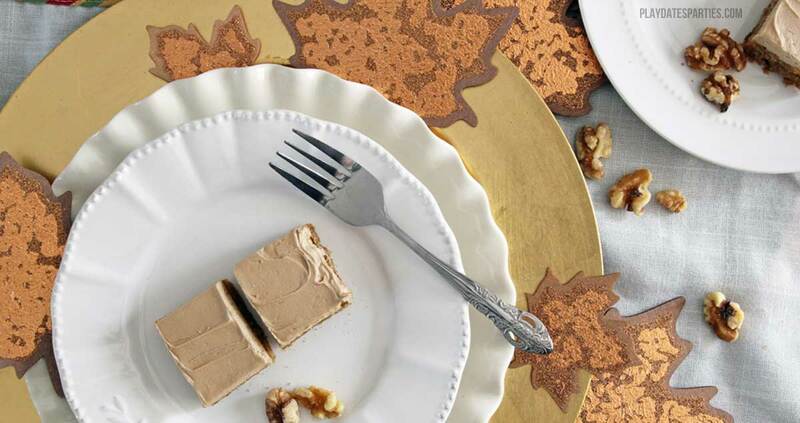 Full of seasonal flavors, they’re the perfect fall or holiday dessert. I love it when a baking experiment turns out better than you ever expected. But that’s exactly what happened when I decided one day to bake sweet potato bars with maple frosting. 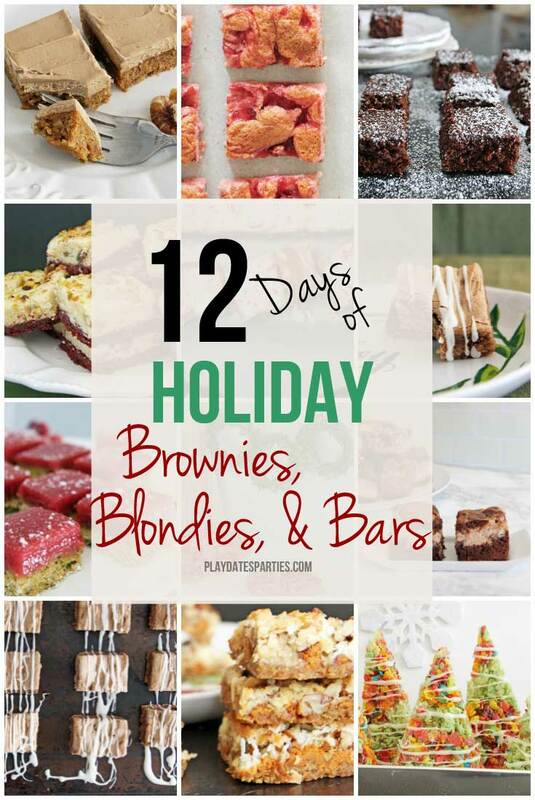 Sweet potatos weren’t originally planned for the 12 Days of Holiday Brownies, Blondies, and Bars series. But one day I found myself with LOTS of extra walnuts, an extra sweet potato, and dessert bars on the brain. And since sweet potato cupcakes are pretty fantastic, I figured dessert bars aren’t really much of a stretch. 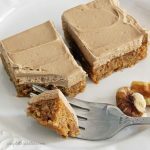 Ground walnuts in the batter help to create a texture like a dense cake, while chopped walnuts throughout the cake add a bit of crunch. And the sweet potato flavor isn’t lost at all in the mix. That said, the frosting caused more frustration than I’d like to admit. I initially aimed to make a buttercream using real maple syrup instead of extract. But none of the usual tricks worked. Either there wasn’t enough maple flavor, or the frosting was grainy and loose from the syrup. Womp, womp, womp. In the end, maple flavored extract came to the rescue. And I’m fine with that. After all, what’s a little experimentation without some on-the-job learning. The final frosting is amazing, and the perfect pair with the sweet potato bars. 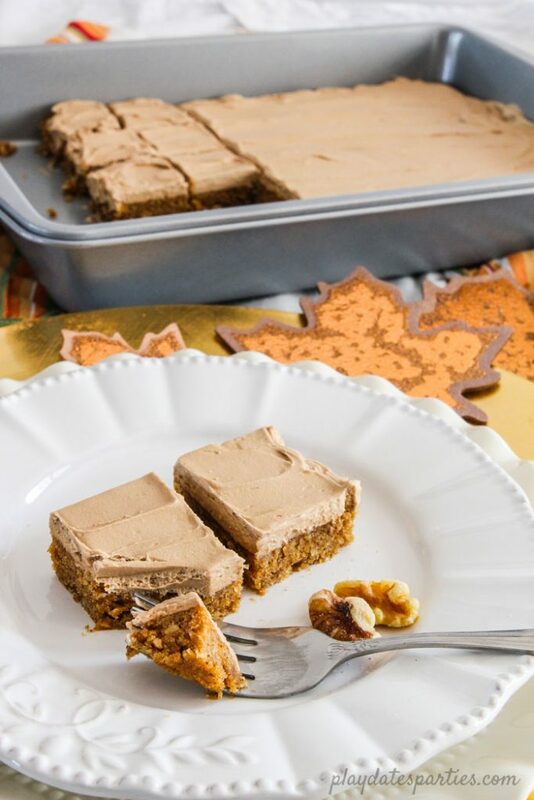 Sweet potato bars with maple frosting are the perfect dessert to place on a holiday buffet. Or make a pan to offer as an alternative to pumpkin pie after Thanksgiving dinner. Either way…hooray for baking experiments! Preheat oven to 350°F. Prepare a 9x13 cake pan with parchment paper. In a stand mixer, beat together the butter and brown sugar until light and fluffy. Mix in the eggs, one at a time. Add vanilla extract and sweet potatoes. In a large bowl, whisk together flour, ground walnuts, baking powder, salt, cinnamon, ginger, nutmeg, and cloves. Slowly add half the flour mixture to wet ingredients, stirring until just combined. Mix in the milk and then add the remaining flour mixture. Fold in 1/4 C chopped walnuts. Spread into prepared pan and bake for 15 - 20 minutes, or until a toothpick inserted into the center of the pan comes out clean. Cool completely before frosting with maple buttercream. Prepare a stand mixer with a whisk attachment. Add remaining powdered sugar 1/2 cup at a time until well blended. Add salt and maple syrup flavoring 1/4 tsp at a time until desired flavor. Add in vanilla extract and whisk to combine. Add whipping cream 1 tablespoon at a time and whip at high speed until frosting is light and fluffy. 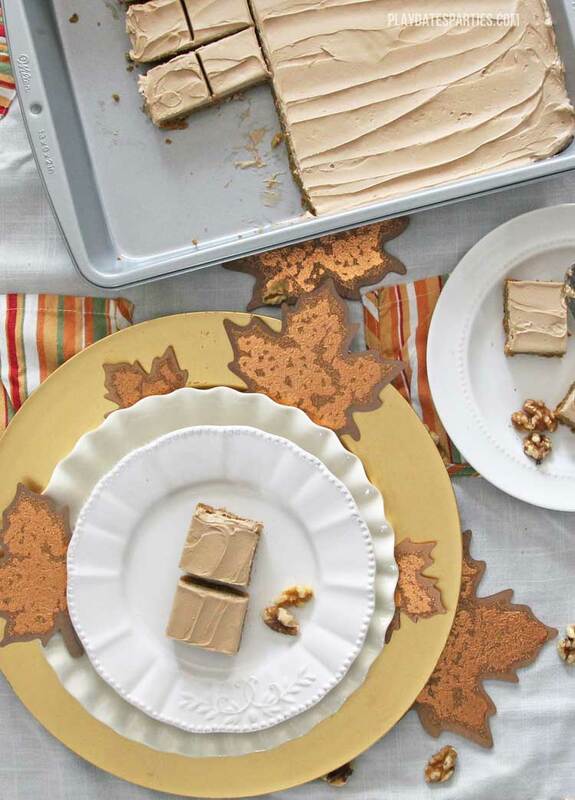 When would you serve sweet potato bars with maple frosting? What is your favorite sweet potato dessert? You are amazing! I have been watching all of your recipes and each one gets better than the last, and that is hard to do, because they are all so outstanding! Well done my friend! I would love it if you shared one of your delicious cookie/bar creations over at my cookie and treat exchange going on right now. Happy Holidays! These look so good. It is different than anything I have seen. I hope to make them soon. These look so delicious! I love cooking with sweet potato instead of pumpkin and my husband loves maple syrup, so these would be a hit at home! These sound and look amazing!!! I have a sweet potato cake that I do in little ramekins for the perfect portion and they are awesome, so I know I’d love this. That frosting looks fantastic as well! These sound really delicious!! A great fall treat – Thanks for sharing on the What’s for Dinner link up! You had me with sweet potato – I have to try this! I have been just looking for maple recipes. This looks so delicious! Thanks for sharing! They sound amazing, I love the idea of sweet potato with maple syrup! 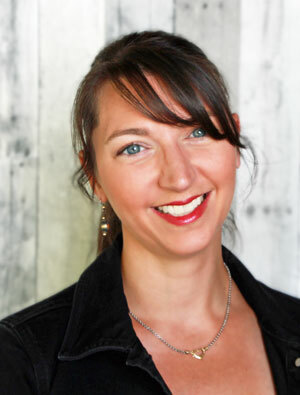 I found your delicious recipe at the Home Stories Link Party. They look absolutely divine and highly addictive. It is on my short list of recipes to try this fall. Thanks for sharing! These look absolutely amazing!! Thanks for sharing your recipe- we are going to have to try these for our next fall treat! This looks really good and a bit different then pumpkin. I really love the idea of maple icing, so delicious. Wow – what the kids don’t know won’t hurt them! Oh these look amazing! I really like baking with sweet potatoes. I make a delicious sweet potato bread. Love the frosting on your Sweet Potato Bars. Visiting from Foodie Friday at Rattlebridge Farm. If you have time, please do come and share this yummy recipe with us at the Hearth and Soul Link Party live on my site. now. Have a lovely weekend! Those look amazing Leslie! Thanks so much for sharing them with us at the Dishing It & Digging It Link Party. Have a great weekend! I am anxious to try these. They look delicious, as well as healthy. I will have to pull out my mother-in-laws’ fancy nut grinder to get the nuts fine enough for this. These look and sound so delicious! Pinning! This sounds amazing. I will be definitely trying this recipe soon. What a creative recipe. I’ve never seen any bars or cookies made from sweet potatoes. And I bet the maple frosting is yummy! Thanks for linking up for Friday Favorites. I’m featuring you this week. Sounds delicious I’m not a fan of maple frosting but my husband is. I’ll have to make a batch without it just for me 🙂 I’m bringing back my Monday link party @ DIY Home Sweet Home (first one will be Oct. 16th) and I would love for you to stop by and link up your recipe! http://diyhshp.blogspot.com. These look delicious! I can’t wait to try them with my daughters. YES, please!!! These look and sound amazing. Such a perfect Fall dessert! Yum! I will definitely give these a try! wow these are something I have never heard of. I would never have thought to use sweet potato but they look absoloutly delicious. Sweet potato and maple frosting – hmmmm! Thanks for sharing with Fiesta Friday. Yum, yum, yum. These look delish! Thanks for sharing on Foodie Friday! These sound really yummy! I can’t wait to try them. Thanks for sharing with SYC. 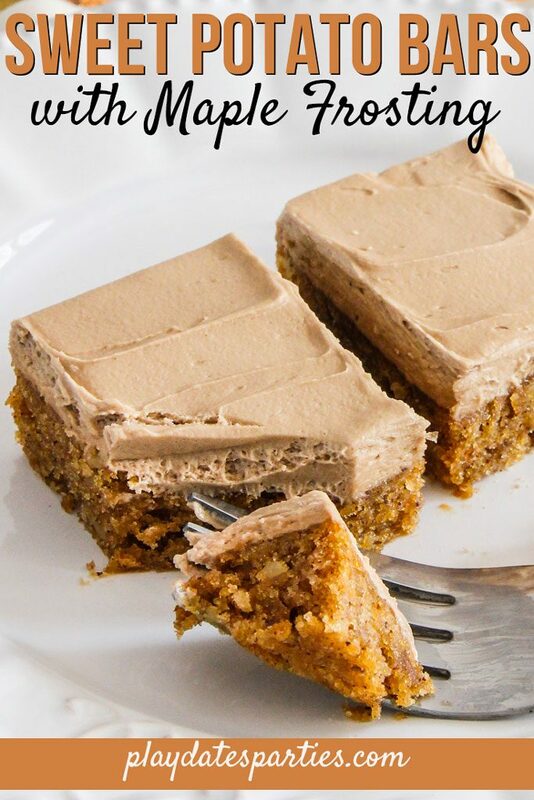 I just love these sweet potato bars with maple frosting. Thanks for sharing this recipe at Fiesta Friday!